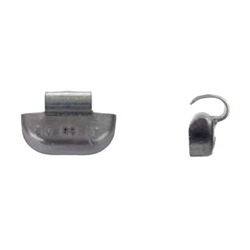 RC Type Lead Clip-on Wheel Weight 2 oz BOWES WW RC-020 BOX OF 25. The RC-Series lead clip-on wheel weight is used on heavy-duty trucks with Firestone, Accuride, or Radical Commander rims. It can also be used with strip-steel rims with curved flanges, such as Budd, Firestone, Goodyear and Redco. Please use rim gauge (RG2) to verify specific applications.